As you may already know, Spirochrome have developed a broad range of Live Cell Imaging probes for the staining of DNA, Lysosome, F-Actin and Microtubules. More than that, SiR-Actin and SiR-Tubulin are the only stains available on the market which enable live cell imaging of the major cytoskeletal cellular structures without the need to transfect cells. As mentioned previously, SIR probes can be used with different kinds of cells and tissues. Here, thanks to the work and the courtesy of Dr Marin Barisic, group leader at the Danish Cancer Society Research Center, we are able to show you visual data of Human Osteosarcoma cells stained with SiR-Tubulin, during the cellular division. What about you? Interested in trying one of the SiR-Probes on your experimental model ? Get in contact your local tebu-bio office to obtain more information or to order your SiR-probes. 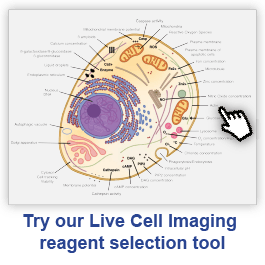 Don’t hesitate to visit our interactive web page to easily visualize our broad offer of Live Cell Imaging tools, and find the one corresponding to your needs.